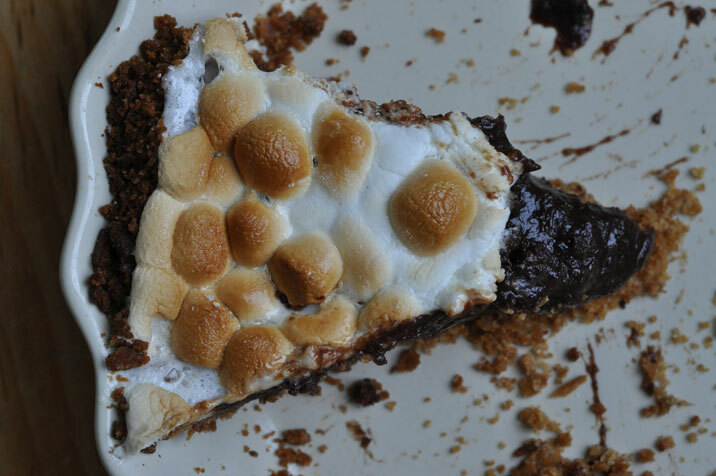 The smash of the party – S’mores Pie! Coco turned 9 this past week. We have a beautiful new pool in town, but no, she didn’t want to make things easy for her mother by having an easy pool party. She wanted a pool party at our house. Of course, we don’t have a pool so we needed to buy one. And, of course, I procrastinated until it was too late to buy one online. So, I spent a day driving from Costco to Walmart with numerous stops in between in search of a large blow up pool. My quest was an utter failure. 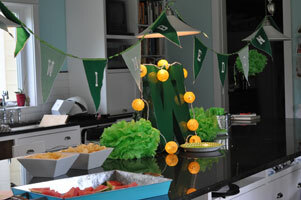 We quickly had to change themes…Luckily, Wimbledon started the day of her birthday and we do have a tennis court in the backyard….and a quick purchase of a slip and slide ensured the girls could put their bathing suits to good use. The party consisted of a little tennis, a little slip and slide, a lot of food, present opening and the big event – the piñata. 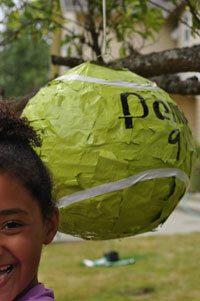 I’m pretty proud of the tennis ball piñata Coco and I made. 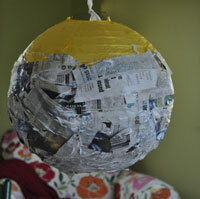 We basically paper mache-ed over a hanging 16″ paper lantern from Hobby Lobby. We paper mache-ed the top half, let it dry, and then flipped it over (still hanging it up) and paper mache-ed the other half. There was still a top and bottom opening. I duck taped one of the openings. The other opening I stuffed with the candy before duck taping it over. Being a lantern it already had a hook, which I left available to use. 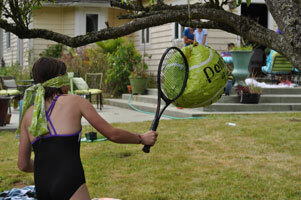 We then hung it outside and spray painted it tennis ball green. After drying, I taped on 3/4 inch wide opaque white tape in a tennis ball pattern and marked on it with a sharpie the label “Penn 9”. I wanted to do “Coco 9” in the Penn brand font, but my co-creator nixed that idea. The girls used an old tennis racquet to whack at it. For food, the birthday girl wanted her favorite macaroni and cheese, hotdogs and watermelon. In a nod to Wimbledon we had fresh strawberries and cream, fresh strawberry cake and lemonade (minus the Pimms). I loved the strawberry cake, however, the big hit was the s’mores pie. This is the second one I have made in a month and I made a different filling for this one. I basically filled a graham cracker crust with my favorite brownie recipe and then topped it with marshmallows. If time was of the essence, you could just used a boxed brownie mix for the filling. The girls were begging me to give their moms the recipe. So, moms, here it is along with the strawberry cake! Whisk together flour, baking powder and 1/2 t. salt. In another bowl combine milk and 1 t. vanilla. In another bowl beat 1 cup of butter until creamy, then add 1 2/3 cup sugar and beat until light and fluffy. On low speed add the flour mixture in in 3 parts, alternating with the milk mixture in 2 parts and then add 2 cups of strawberries and beat until smooth. In another bowl beat together egg whites and cream of tartar until soft peaks form. Gradually add 1/3 cup sugar and beat on high speed until the whites are stiff but not dry. Fold one quarter of egg whites into the batter, then fold in the rest. Divide the batter amongst (3) greased and floured 8x2 inch or 9x2 inch round cake pans. Bake at 375 degrees for about 25 minutes, or until a toothpick inserted into the center comes out clean. Make strawberry filling by heating 2 cups strawberries, 2 T. cornstarch and 1/4 cup sugar in a saucepan. Bring to a boil while constantly stirring. It should thicken up quickly after it boils. Let cool. Make frosting by beating 1/2 cup softened butter with 1 t. vanilla, 1/8 t. salt, and 1/2 cup strawberries. If you like a lot of frosting, double the recipe. 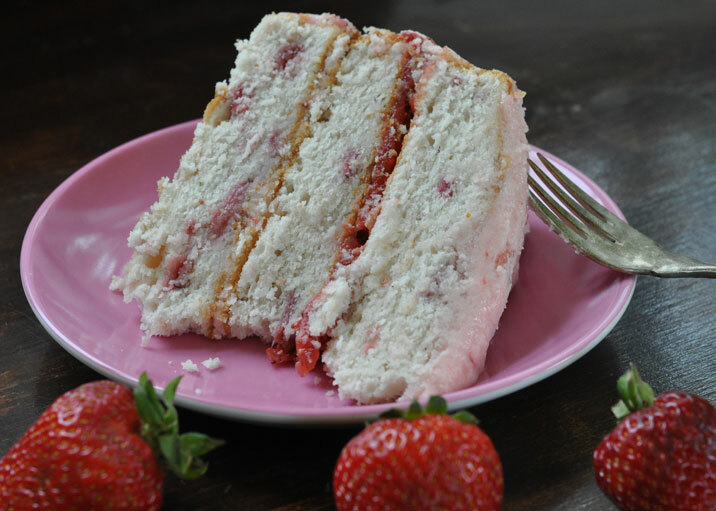 Spread a thin layer of frosting between the bottom two layers and top with the strawberry filling. Spread just frosting between the top two layers. Frost the sides and then the top of the cake. Combine the crumbs with the sugar and butter. Press mixture on sides and bottom of 9 inch pie pan. If prebaking, bake at 375 degrees for 8-10 minutes. Make the chococlate filling by melting the butter in a saucepan over low heat. Add the unsweetened chocolate and stir until melted. Remove from heat. Stir in the sugar and let cool slightly. Add the eggs and stir. Add the flour and stir until smooth. Add the chocolate bar chucks and stir in. Bake at 350 degrees for about 30 -35 minutes or more - keep checking. If the crust starts getting too brown, just cover the edges with some foil. Take pie out and cover with as many mini marshmallows as you safely can. Put back into the oven for another 5 to 10, until the marshmallows are golden. Watch like a hawk so you don't burn those little marshmallows!